What is Snipertag? Snipertag is a variation upon the very popular Lasertag game. In 1986, a company called Worlds of Wonder came up with the idea for a combat game that worked around a set of commercially produced toy laser guns and sensors. As of recently, many companies have picked up were Worlds of Wonder left off and have revolutionized the game from its original conception. Current systems can now include laser-guided scopes, multiple types of firing options, voice communication, 500-yard laser ranges, various status/detection indicators, and multiple programmable game modes. However, the main attraction of the game is that you don't actually fire any type of projectile, but you fire a small beam of visible or infrared light at your opponents. The point or goal of the game is to successfully hit your opponent a given number of times as quickly as possible. The gun and the sensor are relatively complex pieces of electronics that are controlled by a microprocessor-based system. A Liquid Crystal Display and various sounds tell the user if he/she has been hit, how many times they have been hit, how many times their opponent has been hit, and if they have won the game. This information is transmitted from user to another via transceiver circuit on both detector modules. In summary, the entire system consists of the laser gun itself, the body-attached detector, and the control/status panel attached to the players wrist. In conjunction, these components implement a safe and enjoyable way for people to engaged in a simulated combat situation. 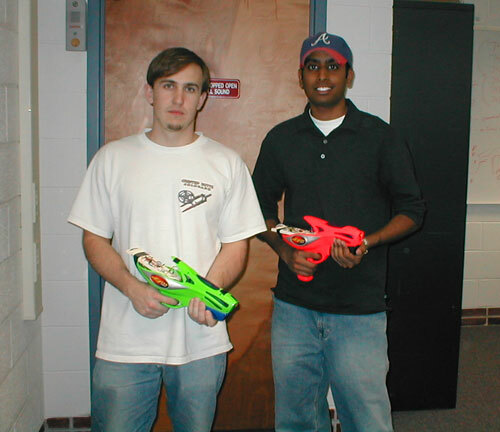 Our motivation for building a modification of the commercially sold laser tag system was based on our inadequate past experiences with the pre-built games. First and foremost, we felt the systems sold today were too bulky and had too many hindering parts and wires from the gun to the detector unit. Therefore, we started out with a goal of not having any interaction between these two components to increase the ease of play. Secondly, we felt that commercial systems did not complement the expanded skill level of older users. At times the detector on any arbitrary user would indicate a hit, even when the attacker had clearly missed the target. This has been a pitfall of these systems for many years and a source of much frustration. So we tried to fix this problem in a twofold manner. First, we change the medium of interaction between the two users from an infrared one to a visible red beam. Secondly, we made the target or detector radius much smaller than commercial versions to develop the accuracy skills of the user. These two revisions combined allow players of this game to be able to know for sure if they have hit the other players target, because they are able to see the beam due to its range in the visible and not infrared spectrum. Also, the smaller target encourages and demands the players to practice using the unit to develop pinpoint precision. This feature gives rise to the name of the game Snipertag as one must be as proficient and competent as a sniper to master this game. Our final motive in building Snipertag was to very simply have a real world applicable final project that would be enjoyable to design, build, and test.